Such alternative treatments as magnet therapy by lessen the effects of anxiety and depression. If you suffer from anxiety and depression symptoms, you know how frustrating day-to-day life can be. Constant worries, feelings of hopelessness or overriding guilt can disrupt your ability to perform simple, routine tasks. Often, it feels as if a cloud is covering you and there seems to be no way out of your emotional distress. You may have even tried a prescription antidepressant but it only leaves you feeling jittery, spaced out or worse – your despairing thoughts intensify. If this sounds familiar, it might be time for you to try alternative therapies to help tackle your depression symptoms. Research confirms that alternative medicine techniques can be very effective at lessening chronic anxiety and depression symptoms. In essence, these therapies help “take the edge off” and induce feelings of calmness; thus, this enables individuals to address the true root cause of their affliction. Depression is often caused by a neurochemical or hormonal imbalance in the body; it can even be triggered by environmental factors such as a poor diet, lack of exercise, inadequate exposure to sunlight, or toxins (such as inhaling mold spores in a home or office). 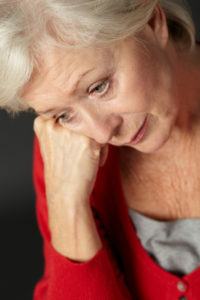 But, often times, people with depression do not have the motivation necessary to address these underlying factors. In these instances, utilizing an alternative therapy can provide the extra boost needed to beat those constant feelings of gloom and worthlessness. Regardless of the specific symptoms presented in the depressed patient, conventional medicine relies solely on the use of prescription drugs and psychotherapy. Conversely, alternative therapies aim to treat each individual’s unique symptoms. Take acupuncture, for example. Research was conducted to see if acupuncture could effectively relieve depression when the treatment protocol was adapted to address an individual’s specific symptoms. Study participants were divided into three groups: The first group received acupuncture treatments specifically tailored to their unique depression symptoms; the second group received general acupuncture treatments not specific to depression; and the third group received no acupuncture treatments at all. The results indicated that the participants who received the tailored acupuncture treatments experienced a significant reduction in their depression symptoms in comparison to the two other groups. In fact, the tailored acupuncture treatments were so successful that at the end of the study, over half of the participants no longer met the DSM-IV diagnostic criteria for depression. Another alternative therapy – magnet therapy – involves the use of varying sizes and strengths of magnets strategically placed on the body. Most often, magnet therapy is used to reduce pain and inflammation. But recently, practitioners have started using magnetic therapy to alleviate stress, anxiety and depression symptoms. There are a couple of theories on how magnet therapy actually works. Some cells and tissues in the body give off electromagnetic impulses; therefore, it is hypothesized that magnetic fields can encourage the flow of oxygen to cells, increase blood flow, alter nerve impulses, and readjust brain neurotransmitters to improve emotional well-being. Another possible explanation for the effectiveness of magnet therapy is the magnet’s composition. Magnets are made of rare earth elements such as iron, nickel, cobalt, boron, and neodymium. It is thought that exposure to these elements actually decreases pain levels and improves mood as opposed to their magnetic field effects. There are two basic types of magnet therapy: First, stress-relief magnets are sold over-the-counter as bracelets, shoe insoles, knee braces, back supports or belts. These magnets are generally used for pain conditions and are unlikely to provide any benefit for depressed patients, unless their depression is due to chronic pain. The second form of magnet therapy, however, is currently being used to ease certain types of depression symptoms. People who have an implantable device such as a pacemaker, defibrillator, or medication pump should not undergo magnet therapy as it may interfere with the function of the medical device. Magnet therapy is also not recommended for young children or pregnant women. Keep in mind, while acupuncture and magnet therapy may temporarily relieve depression symptoms, they will not correct the underlying root cause of your illness. Unless you change some things in your life that contributed to this debilitating condition in the first place, you may very well lapse right back into that depressive state. To discover what may be causing your depression symptoms – and more importantly – learn the natural remedies to reverse these underlying factors, subscribe to the Premium Content section of the website and find the answers you need in our comprehensive guide, Natural Remedies for Depression: Beating Depression Without Drugs. Depression and acupuncture: a controlled clinical trial. Psychiatric Times Online, 2000, 22(3). Acute prefrontal cortex TMS in healthy volunteers: effects on brain 11C-alphaMtrp trapping. NeuroImage. 2007, 34(4):1658-1664. DOI: 10.1016/j.neuroimage.2006.08.059. Rapid-rate transcranial magnetic stimulation of left dorsolateral prefrontal cortex in drug-resistant depression. Lancet. 1996, 348(9022):233-237. DOI: 10.1016/S0140-6736(96)01219-6. *Consult your doctor or a healthcare professional before beginning magnet therapy. acupuncture for, acupuncture treatments, alternative medicine, antidepressant, anxiety, anxiety and depression, beating depression, beating depression without drugs, boron, brain, children, chronic anxiety, chronic pain, depressed, depression, depression symptoms, diet, exercise, for depression, health, hopelessness, inflammation, iron, manage depression, mold, mood, natural health, natural health practitioner, natural remedies, natural remedies for, natural remedies for depression, pain, people with depression, prefrontal cortex, remedies for depression, stress, stress anxiety and depression, stress relief, toxins, types of depression, without drugs. Thank you so much for providing individuals with an extremely wonderful opportunity to read from this website. It is usually so fantastic and I visit the site a minimum of three times weekly to study the new issues you have. And of course, I am also actually pleased concerning the magnificent guidelines you give. I have read many articles about medical magnets. Where do I place a magnet to relieve anxiety. Why is it a secret?